KUALA LUMPUR, 4 Dec – Congratulations to Assoc. Prof. Dr. Norhayati from Malaysia Japan Institute of Technology (MJIIT), UTM for being appointed as Malaysia Convention & Exhibition Bureau (MYCEB)’s Kesatria Malaysia. The Minister of Tourism, Arts and Culture, Tourism, Arts and Culture Minister Datuk Mohamaddin bin Ketapi confers the appointment, today. Dr Norhayati in her role as Kesatria Malaysia, has to promote the benefits of hosting and/or inaugurating international conventions to the industry peers and colleagues. Kesatria Malaysia, also known as Conference Ambassador in other countries, is selected among thought leaders in their field of expertise and recognised for their professional achievements in bidding for and hosting international conferences. Malaysia has been the location for a long list of prestigious international conferences that provide excellent case studies on how to be a successful host, thus it is the local host of these international conferences that MyCEB seeks to engage and facilitate in transmitting their experiences. 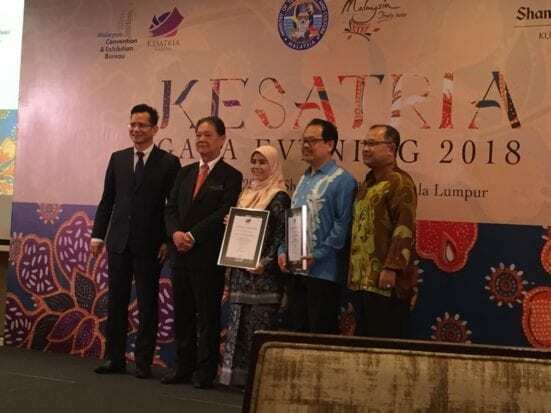 Previously, the Director of the Centre of Engineering Education UTM, Prof. Dr. Khairiyah binti Mohd Yusof and Senior Director of the Institute of Future Energy UTM, Prof. Dr. Arshad bin Ahmad were also selected as Kesatria Malaysia. With the appointment, it is hoped that Dr Norhayati can bring UTM and Malaysia names to become more prestigious in the eyes of the world.